One of my life verses, I consider it daily, is Psalm 119:165. It says, “Great peace have they who love Your law, and nothing causes them to be offended.” Nothing causes them to be offended. That’s powerful. That means that as we value God’s Word over all else, it always weighs heaviest on the scale in our heart. When good things happen, the truth of the Lord is considered more important. When bad things happen, the truth of the Lord is considered more important. When we have a choice between our emotions and God’s truth, we choose God’s truth. When Jesus taught His disciples how to pray, He included a line about forgiveness:”Forgive us our trespasses, as we forgive those who trespass against us” (Matthew 6:12). For a minute, I want to focus on one important phrase in this sentence: “as we forgive“. “As” means “to the same degree or amount”, so let’s replace the word for its definition and see how the same sentence reads: “Forgive us our sins, to the same degree or amount that we forgive those who sin against us”. Read that way, ask yourself: in your life, is this phrase an affirmation or is it a reproof? Do you already forgive others to the same degree in which you would want to receive forgiveness yourself, or do you need to work on it? Are you pleased that you are asking God to forgive you to the same degree or amount that you forgive others, or are you concerned that He might just forgive you in the same way you forgive others? Unforgiveness and harboring offense will stop your progress like nothing else in your life. You will lose relationships, you will lose ministry opportunities, you will hurt more than yourself and the offender. Everything will be affected, and it will spread like cancer until you let it go. Unforgiveness and offense insist on being held with both hands, they won’t leave room for anything else. Jesus also tells us, “whenever you stand praying, if you have anything against anyone, forgive him, that your Father in heaven may also forgive you your trespasses. But if you do not forgive, neither will your Father in heaven forgive your trespasses” (Mark 11: 25-26). Refusing forgiveness, refusing to release offense, will take up all your energy. Unforgiveness will consume your mind and thoughts. The longer you hold it, the more your life and relationships will be affected. 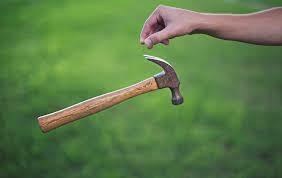 Let’s come back to my husband’s quote: “When all you have is a hammer, everything is a nail.” Good mental picture: with only this tool in your toolbox, you have no choice but to pound everything in sight. I think another way of saying this is that the unforgiveness in your heart acts as a filter. Everything that comes to you must pass through this unresolved offense. Everything that comes to you must come through this hurt, and everything becomes about you. Unforgiveness makes you self-centered (that’s different than selfish in this context – can you appreciate the difference?). Everything becomes a piece of the offense. Every event, every action, every word, passed through this hurt becomes tainted by the hurt. Just like your heart pumps blood to every part of your physical body, giving life and health to every organ and limb; unforgiveness will pump discord, bitterness and discontentment to every part of your spiritual life. Once your spirit is poisoned by unforgiveness, you are really “in trouble”. I’m convinced that a vast majority of our problems are rooted in unforgiveness. Is there a situation that you can’t get off your mind? Is there a person that you can’t respond to with the love of Christ? Are you looking for this person to fail, or even hoping that they will? You probably have unforgiveness on some level, even buried in there. Root it out, my friend – open your hands, release the offense, and allow the Lord to fill you with His goodness once again. Refuse to allow offense or unforgiveness to stop your progress – you have so many places to go and so many things to do! When you finally let it go, oh my goodness – the relief is indescribable. God is so generous and so kind, you’ll be overwhelmed by that first “breath of fresh air”, filling your spirit with freedom and peace.